We provide retailers and internet based companies with a full line of credit card processing services to allow them to take payment online for their products and services. This type is good for a physical retail businesses that requires a swipe terminal. You will be able to use the card terminal as well as the ability to create virtual credit card payments online. 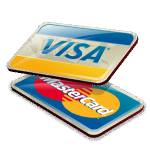 This type of account is good for any company that needs to integrate credit card processing into their web site shopping cart, service professionals, and any others that need a virtual terminal to process credit card payments from their customers. This type does not require a swipe terminal and can be integrated into most popular shopping cart systems. This type of account is also good for custom web developers who need an API to take payment online.